We are engaged in manufacturing and supplying of wide range of Angle Straightening Machines. These compact sized machines are robust in construction and ensure maximum durability and sturdiness. 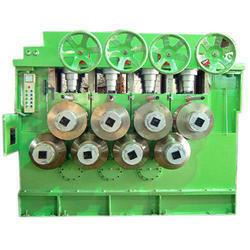 Machine function is to straighten various deformed products such as channels, flats, I-beams, squares etc. is based on a well proven rotary straightening process. So as to uphold the standing we have built up, we are engrossed in presenting a broad compilation of Hydraulic Angle Straightening Machine. We offers an innovative range in the field of technology of straightening with Angle Straightener Machine. The press can efficiently handle Angle, Flat and profile material of different hardness. Being one of the trusted organizations in the market, we are indulged in providing a wide range of Angle Straightener Machine. Rollmill is a renowned name that offers Angle straightening Machines which have their applications in straightening rolled steel sections including round, angle, channels and beam. Our products are just known for delivering best performance and longer service life. They are made from high grade material and by use of excellent engineering processes. Being one of the eminent names of the business, we are involved in manufacturing, retailing and supplying Angle Straightening Machine that can be acquired at reasonable rates. Available in numerous specifications, these efficient and robustly constructed machines are massively appreciated and welcomed by our esteemed customers.